Moscow residents voted for a new mayor on Sunday for the first time in almost a decade, with acting Mayor Sergei Sobyanin holding a large lead according to exit poll results, but without a clear margin over 50 percent that would allow him to win the mayorship in the initial round of voting. As of around 1:30 a.m. early Monday, with 64.66 percent of ballots counted Sobyanin had received 51.72 percent of the vote and his main opposition challenger, Alexei Navalny, was in second place with 26.9 percent. Communist candidate Ivan Melnikov was in third with just over 10 percent and the three other candidates each had around 3 percent. Sobyanin spoke Sunday night at a rally on Bolotnaya Ploshchad across the river from the Kremlin, saying that while the votes had not all been counted yet, "in the end we will win anyway," and that the city had organized the "most honest, most competitive, most open elections in Moscow history." Although the major pollsters gave disparate exit poll results, all of them said that main opposition challenger Alexei Navalny got more votes than was earlier predicted, with state-run public opinion center VTsIOM saying 32 percent of voters surveyed chose him, compared to 53 percent for Sobyanin. Despite many voters believing that the election result was predetermined in favor of the Kremlin-backed Sobyanin, those poll results seemed to prove otherwise — just a week before, VsTIOM predicted that Navalny would get only 16 percent of the vote. Another state-run pollster, FOM, also gave Navalny almost 10 percent more than predicted before, saying he was expected to get more than 29 percent of votes. One voter, Kirill, 25, wore a skeptical grin as he cast his ballot in the northern district of Sokol on Sunday, saying that "it is clear who is going to win. It does not matter whether we elect the future mayor directly or he will be appointed. The name will still be the same." But no matter what the exact vote totals turn out to be, the result appears to show a transformed city where an aggressively anti-Kremlin candidate can garner hundreds of thousands of people's votes. While the wave of protests that followed the contested 2011 elections to the State Duma has gradually subsided, it appears society has been undergoing submerged societal shifts that were difficult to capture by opinion researchers. The results coming from Yekaterinburg, Russia's fourth-largest city and an important regional political center, offered more evidence that the change was not limited to Moscow. At press time Sunday night, exit polls showed Yevgeny Roizman, a tough-talking, self-made politician whose social projects have been repeatedly harassed by the local government, winning mayoral elections in the city with a margin of 10 percent. He declared victory before midnight local time. Eight regions also voted for governor on Sunday, and the same number of cities voted for mayor, including Moscow and Yekaterinburg. While for Navalny the main goal in the Moscow mayoral election was to garner enough votes for a second round, Sobyanin found himself in a trickier situation, in which his apparent goal was to win fairly but also to demonstrate a very strong result to have a mandate for five years in office. 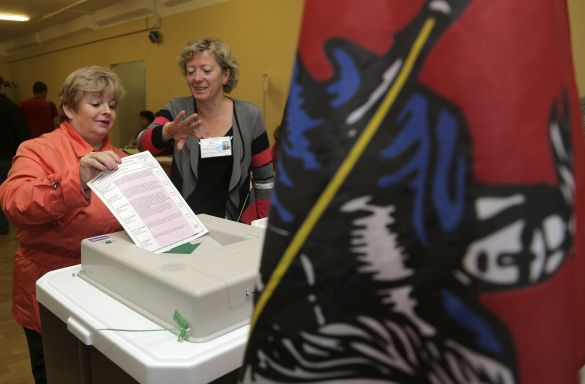 An elections commission official helping a woman cast her ballot Sunday, with the Moscow city flag seen at right. Navalny issued appeals to his supporters all day to vote, but the overall turnout appeared low, with pollsters predicting it to be in the vicinity of 30 percent. The results can be seen as an impressive step forward for both Navalny as well as a political boost for Sobyanin — although Navalny, if he loses, could face a harsh turn of fortune. He is currently appealing a conviction on embezzlement charges that could send him to prison for five years. Sobyanin, who served as head of the presidential administration for five years up until 2010 and is widely seen as one of President Vladimir Putin's most staunch loyalists, called for snap mayoral elections just over three months before election day. The move was widely seen as an attempt to secure victory in the capital as the government was seeing its support base gradually shrinking in large urban areas across the country. Sobyanin himself said the decision was determined by the need for Muscovites to approve his large-scale program of revamping the city. Being one of the ten largest city economies in the world, Moscow carries massive political and financial weight in a country that has undergone significant economic and social shifts over the last decade. Whoever rules Moscow can declare himself one of the most influential politicians in Russia and use it as a base to move up the ranks. In 1999, then-Mayor Yury Luzhkov was one of the main candidates to succeed former President Boris Yeltsin, engaging in a bitter public feud with the president's family. He lost the race, and in 2010 Luzhkov became one of the few regional heads ever to be dismissed due to "loss of trust," a traditional legal formula for political banishment. Luzhkov cast a ballot in Sunday's election, but said the current mayoral vote lacked "drive." 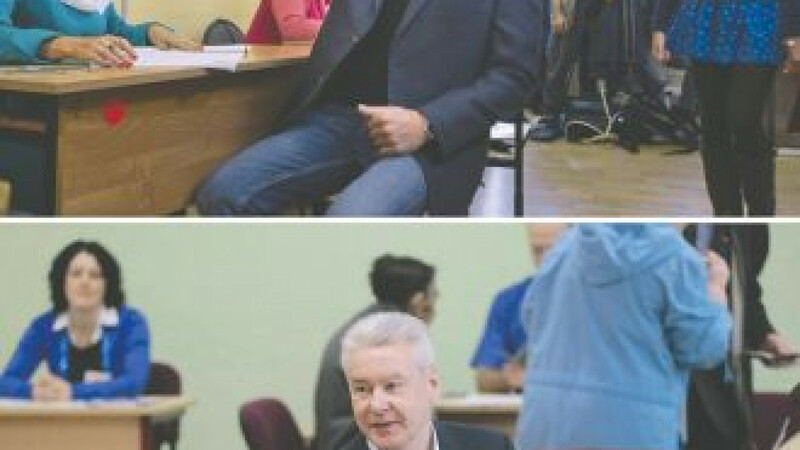 Sobyanin, after being appointed to replace Luzhkov, ran the city for three years in a style that contrasted strongly with that of his predecessor, building his reputation on everyday city affairs, such as metro construction and improving facilities, instead of politics. This also emphasized his differences with Navalny, who has been criticized for a lack of administrative experience, something many believe is a prerequisite for running a city of 12 million people. A lawyer and anti-corruption muckraker, Navalny ran a much more political campaign, with the main idea that a change of power in Moscow would help trigger further fundamental changes in the rest of Russia. Many pundits said Sobyanin was aiming high, with the Moscow campaign a way to obtain enough legitimacy and political weight to tackle one of the highest posts in the country, which some say is the most important after the presidency. In an attempt to broaden his appeal to the emerging group of tech-savvy, foreign-travelled middle class, he launched a campaign to make Moscow a trendy place, ordering face-lifts of many of the city's public spaces, most famously Gorky Park. Prime Minister Dmitry Medvedev, who replaced Luzhkov with Sobyanin, voted Sunday without offering any direct support to any of the candidates. But President Putin clearly demonstrated his preference, saying: "This post needs a technocrat, who knows how to work and what to do."